Commentary: Our hats off to Univision! Ya era tiempo. Univision Communications Inc., the leading Spanish-language media company in the U.S., has announced its plans to provide the most complete campaign and election coverage in its history through its television, online, mobile and radio platforms. Our hats off to Univision!! Ya era tiempo. For so long, there has been an urgent need for stepped up professional political coverage in Spanish to ensure our growing community receives the necessary information in order to make an informed decision about who our potential leaders are. Now that the presidential election is upon us, There is no better time for Univision to have stepped up to the plate and take on this critical endeavor. There has always been the need but not necessarily the will from the corporate leadership of any of the networks that cater to Spanish dominant Latinos. The Spanish language networks have always been in need of investing in their Washington DC bureaus and over time some have diminished their assets in our nation’s capital as opposed to making them more robust. Having already hosted the first live Spanish-language presidential forums in television history during the primary season, and co-hosting a debate with CNN, Univision will continue to lead the way in providing Hispanic America the most complete and trusted campaign and election night coverage available anywhere. On the network side, coverage will begin with a special edition of its critically acclaimed Sunday morning talk program, “Al Punto” (To the Point) hosted by network news anchor Jorge Ramos, which will air the Sunday before the start of each National Convention. Rolando Nichols from Univision’s flagship station in Los Angeles – KMEX – and Fernando Pizarro – Washington DC correspondent for the Univision stations – will be providing coverage for the local stations. In addition, special editions of the California, Texas, and Puerto Rico political roundtable programs produced by the Univision Television Group, each called “Voz y Voto” (Voice and Vote), will be produced from the site of each convention. On Election Day, Univision Network’s coverage will start in the morning on “Despierta America,” and continue with special live news briefs every hour and as events unfold throughout the day, reporting not only on the presidential race, but on key congressional and gubernatorial contests, as well. 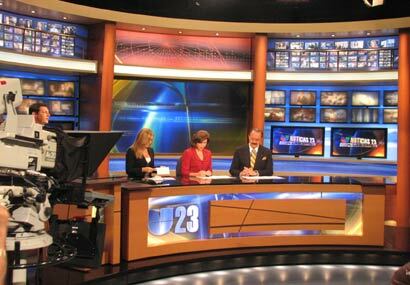 In local markets, Univision stations will provide in-depth local election coverage during their scheduled newscasts. Maria Cardona is a principal with the Dewey Square Group’s Latinovations Division. Cardona was formerly Senior Vice President for the New Democrat Network (NDN) and Director of NDN’s Hispanic Project. Prior to NDN, Cardona served as Communications Director for the Democratic National Committee.